Personally, I’m a big fan of the ladybug because it is another “core” piece that has its own sense of purpose. While the mosquito was a nice addition to the game, making it a “wildcard” seemed a little like they phoned that one in for lack of any better ideas. But the ladybug… Move two spaces on top of the Hive, then must come down on the final move. Strict, but basic rules. The movement to me feels not unlike the knight piece in a game of chess; and just like the knight, you can use this type of not-quite-straightforward movement to your advantage against your opponent. Many players like to compare the ladybug to the beetle simply because both pieces are allegedly allowed on top of the hive, but I disagree. During gameplay the ladybug often feels like a less restricted grasshopper, who is allowed to take a turn without needing to operate along straight lines. While the strict “two on top and then one to come down” movement SOUNDS restrictive, you often find that the hex pattern of the board allows for movements where you can circle the landing area before coming down. The net result can appear as a “1 up and 1 down” while still technically following the rules by “moving” pointlessly to an extra tile before coming down. This tends to make the ladybug even harder to read for players who are not used to this piece. In the end, I can’t say enough good things about the piece. Highly recommended – this feels like it truly belongs as a part of the game rather than an add-on, and we never play without it. I love Hive. It’s a quick, it’s strategic, it’s highly portable. (How many games can you play on the beach?) Prior to purchasing the Ladybug expansion, I’d purchased the Mosquito expansion. Certainly, the Mosquito is extremely versatile—the ability to copy the ability of any insect it is adjacent to, so it is probably not fair to put the Ladybug in the same category of value as the mosquito. The insect that it is most like is the beetle—except faster. Altogether, it moves three spaces—two on top, then one down, ending its turn beside other insects. Really, it can be quite useful. Now is it worth the money for the expansion? I like the game, and the quality of the tiles is as good as the others, so I was good with completing the Hive set with this new bug. 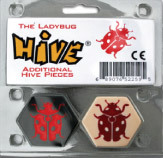 I love Hive, and the Ladybug is a nice expansion. Freshen things up! Add a Review for "Hive: The Ladybug"